Birch Bros can trace their transport antecedents back to 1810 when William Birch left Plymouth in Devon to seek his fortune in London. 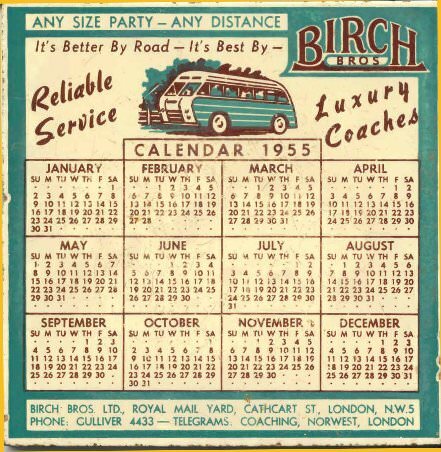 The proud story of the past and future of the family business appeared inside the Birch timetable for many years. His daughter-in-law Elizabeth, assisted by her two sons, progressed from horse cabs to horse buses in 1847, running from Pimlico to Mansion House. Subsequent expansion through following generations of the family saw them working on a succession of London routes and becoming members of the then current horse omnibus associations (eg the Camden Town Omnibus Association and the Atlas and Waterloo Omnibus Association). The associations were disbanded by 1909. Thus the Birch family have been in the transport business since long before the days of the motor bus. Motor vehicles joined the fleet in 1919 (an earlier short lived experiment with motors in 1907 having been unsuccessful) and operated See Britain tours. 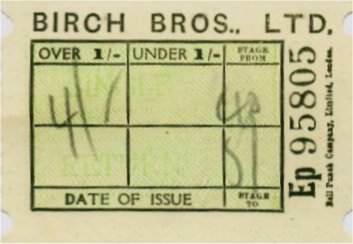 Birch were also active in the London taxi business. The firm re-entered the London bus business in 1925, but with an eye to the future and the impending changes that were to come in the early 1930s with the establishment of the London Passenger Transport Board in 1933, they pioneered a country route from London northwards to Bedford in 1928. This was extended to Rushden and Kettering (at a lesser frequency) by 1930. 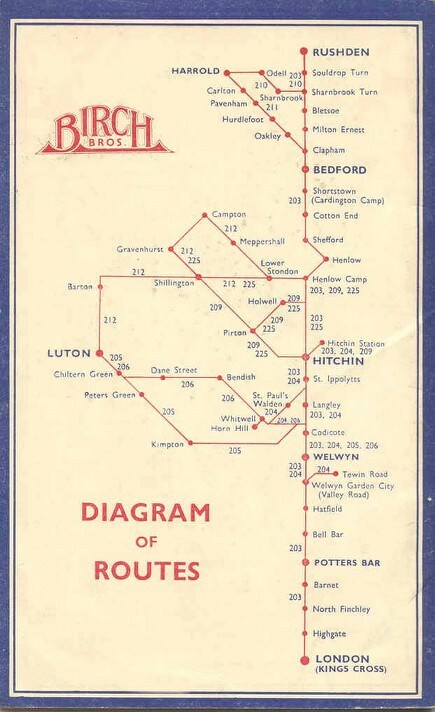 Originally referred to as routes B and K - later combined as route BK - in 1942 this was re-numbered as Birch route 203. They bought out Beaumont Coaches who competed over part of the route to Bedford in November 1932 (Beaumont had previously bought out another earlier competitor Constants Coaches in 1929). During the latter years of the 1930s the country operations were expanded through the acquisition of a number of smaller operators in the counties of Hertford and Bedford. Firstly in January 1938, Birch Brothers acquired Wright ("Pirton Belle") of Pirton, together with his daily route from Hitchin to Pirton. The latter became part of route 209. Wright had also run between Pirton and Luton and Pirton and Letchworth. Birch attempted to link these into a Luton - Letchworth service but was unsuccessful following refusal of a licence by the Traffic Commissioner. 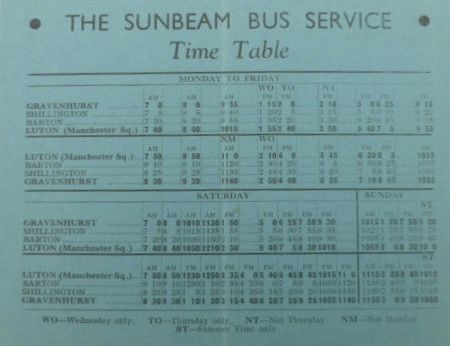 Two months later in March the firm acquired Fisher ("Sunbeam") of Gravenhurst, including routes from Campton to Luton (becoming part of 212) and Gravenhurst to Hitchin (part of 225). Then came Twydell of Shillington, which Birch absorbed into revised routes 209 and 225 from Shillington to Hitchin. The following month Hancock of Horne Hill, Whitwell ("Whitwell Bus Company") was taken over along with routes from Luton to Whitwell, and from Hitchin to Whitwell (later 206 and 204). 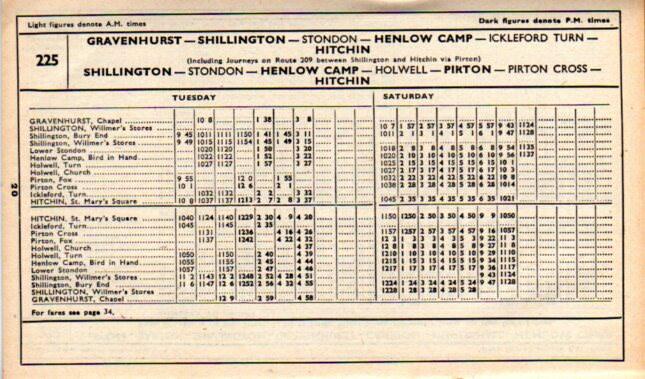 Also in April Birch acquired Cardings of Kempston ("Swallow Bus Service") and added the Harrold-Bedford route (211). 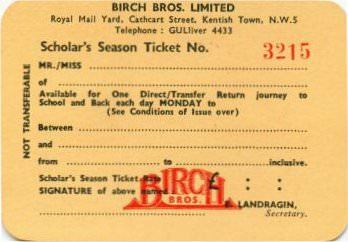 Now in May of the same year 1938, Birch turned their attention to the Rushden area, and three local operators Abbot & Sons, G. Robinson, and G. H. Scroxton were taken over together with their tours and excursion licences from Rushden. 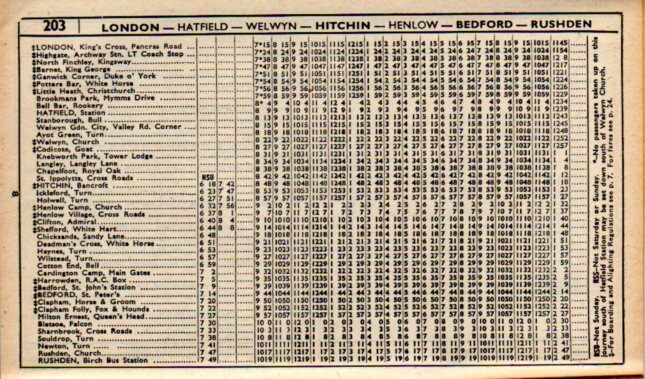 Then finally for 1938, in July Jenkins (trading as Perseverance) of Bury Road, Shillington was purchased and three more routes Meppershall to Luton; Shillington to Hitchin; and Henlow Camp to Luton acquired (part of 212). A new modern depot had been built in High Street North, Rushden during 1937, but the increase in vehicles required to operate the additional country services meant that a further depot was needed and this was built in London Road, Henlow Camp, near the RAF base, and opened in December 1938. 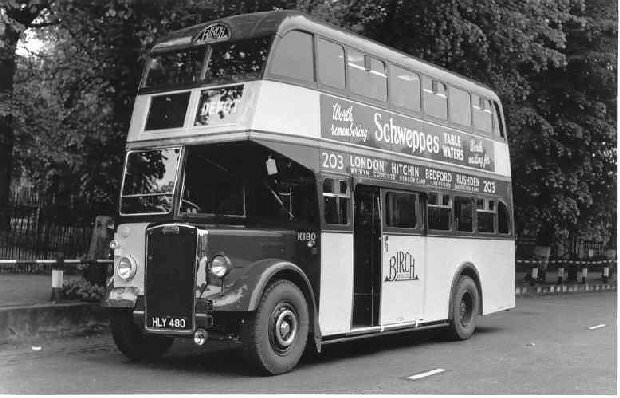 Thus ended a momentous year of expansion for Birch Bros.
War came and by 1940, double deckers were running on the trunk London to Rushden route, and on the country routes as well, particularly Henlow - Luton (212). A further acquisition in June 1944 was Enterprise of Kimpton with their Welwyn - Kimpton - Luton route (the Birch 205 service). Post war there were concerns that passenger transport businesses might be nationalised by the Labour government then in power - a natural concern from a family business who had already seen their original operations in London lost to LPTB in 1933. These concerns may have been a contributory reason for splitting the coach business from the bus business into a separate company. Always proud of their independence, the feared nationalisation of 1949 never came to pass. 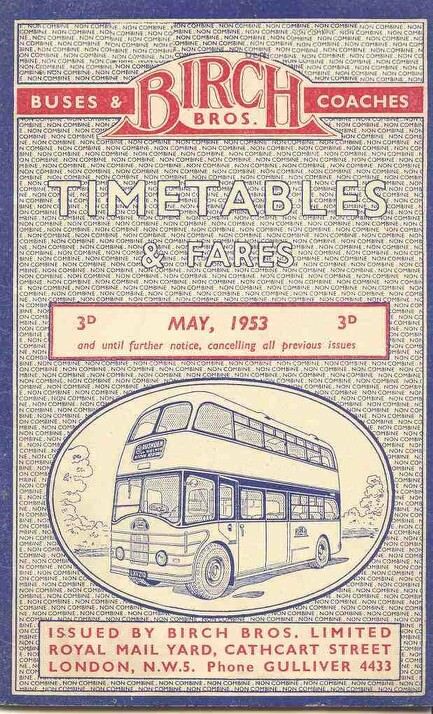 See how proudly the cover of the 1953 timetable shown below is repeatedly printed with the words "non combine". The principal route was always the 203 from London Kings Cross through Welwyn, Hitchin and Bedford to Rushden in Northamptonshire. In pre-war days it was extended further to Wellingborough and Kettering a couple of times a day. Probably to the chagrin of the Birch management, the route missed the potential traffic in post-war years from the growth of the new towns at Stevenage and Welwyn Garden City. The latter was tantalisingly skirted just to the west and whilst attempts were made to reroute the service through Stevenage, these were refused by London Transport, who controlled the licensing and regulation of services in the then "London Special Area". 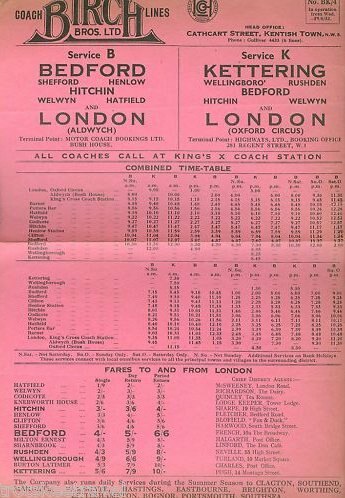 In 1955 the 205 and 206 Luton - Welwyn services were increased in frequency and extended to reach Welwyn Garden City. On Saturday afternoons a 30 minute frequency was operated. 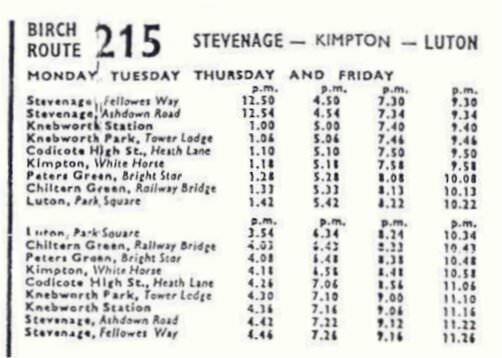 Stevenage was eventually reached - not by the 203 - but by a new route 215 from Luton from 17th June 1956. However the 215 timetable seems to have been designed primarily to take people to Luton. But with fuel rationing following the Suez crisis at this time, cut backs on this and other country area routes soon followed. The 203 operated hourly in the 1950s with double deck buses and the "Marlborough" class epitomised the Birch Bros operation as I remember it. These 53 seat double-deckers had eye-catching rounded Willowbrook bodies on a mix of Leyland and Guy chassis, and unusually had a luggage pen at the front of the upper deck. Some of the other buses in the fleet carried bodies that Birch had built themselves in their workshop and depot situated at Royal Mail Yard, Cathcart Street, Kentish Town, London NW5. The name reflected their mail carrying business for the Post Office back in horse-drawn stagecoach days! As years went by the company, in common with other transport providers, carried fewer and fewer passengers. An innovation in October 1959 was to reroute part of the main 203 service onto the newly opened M1 motorway, making a faster journey between Bedford and London. This was designated as route 203M and progressively the number of through journeys to London on the original route 203 was reduced, with most of the runs southwards terminating at Welwyn (the hourly frequency was maintained northwards from there to Bedford and Rushden). 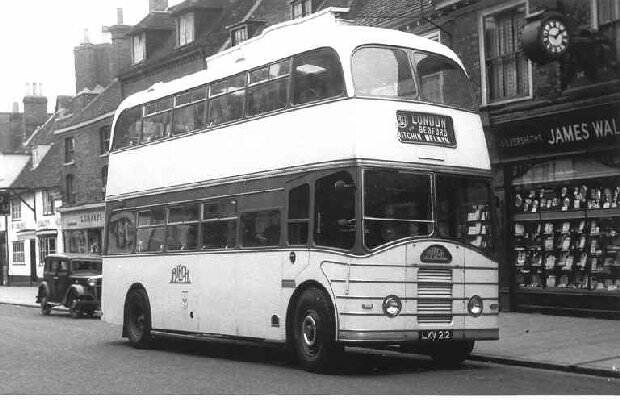 The last double deckers ran in September 1967 when the last three Leyland Titans were withdrawn from Henlow. Previously on the 26th December 1963, after over 130 years running, the last Birch Brothers taxicab had been withdrawn. Given the continuing downturn in bus passenger numbers it was decided to abandon the stage carriage services altogether, with the country routes discontinued on the 14th October 1968. The depot at Henlow Camp closed then as well. During the last few years the depot inspector here had use of the unique Birch / Standard diesel taxi. The last arrival at Henlow on the 203 in the early hours of the 15th October was driven by Charlie Taylor who had driven the first bus out of the depot when it had opened in December 1938! Finally on the 14th September 1969, the last two routes 203 / 203M were passed to United Counties together with twelve vehicles. Rushden garage was sold. 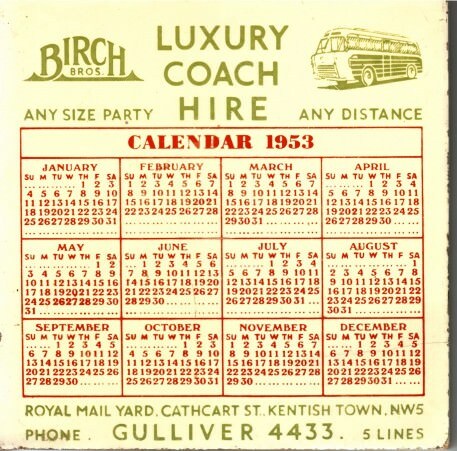 The bus operations of Birch Bros were no more, although the coaches ran for a few more years from Kentish Town. On 1st February 1971 the business and the coaches were sold to the George Ewer Group, and the Birch name faded from the public transport scene for ever. Route 210 ran mainly positioning journeys from Rushden to work the 211, whilst both the 213 and 215 were short-lived routes. A Birch timetable from June 1932 showing route B to Bedford and route K to Kettering. Note that route K to Rushden (2 journeys) and to Kettering via Wellingborough (1 journey) started from Oxford Circus before picking up at Kings Cross coach station. Similarly route B started from Aldwych. Later the routes were combined as BK and eventually became the famous 203 of later years. My father Les Sales was depot inspector at Henlow Camp until the end of Birch operations from there in October 1968. He had been a Birch conductor before that and I used to travel to school on the Birch bus. We knew Charlie Taylor who drove the last service. Les's notes include these route updates. Further consolidation of the Harrold - Bedford route was achieved in 1951 when the business of Mrs Jarvis of Carlton was acquired, giving Birch all of the timings on this route. A very short-lived route was attempted in 1959, numbered 215 and lasting only a year, from Hitchin to Stevenage via Codicote. 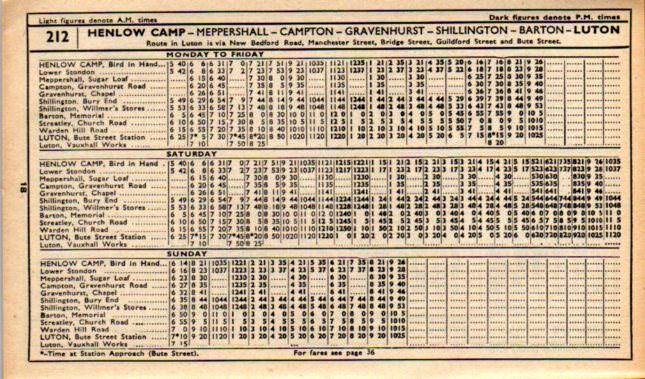 The tours and excursions from Henlow, Hitchin Letchworth and Baldock were an important part of the work from Henlow Camp depot right until the end. Destinations included Great Yarmouth, Stratford on Avon, Margate, Southend and many others. My grandfather, Eric Landragin, was the accountant for Birch Bros from 1930 to 1943; and then from 1945 to 1971 he was assistant director when he retired aged 72. I have one of the calendar tiles from 1953. I think he got the ‘Keys to London’ for his contribution to keeping transport in London going through WW2 and my mother said he went up to London every day regardless of the bombing. and operations of Birch Bros Ltd by the Rotary Club of Rushden Chichele.